Entenmann's has a history of helping others and now they're at it again. They're partnering with the Great American Milk Drive to help deliver 100,000 servings of milk to children and families in need across the country! Keep reading because there's a giveaway for you to enter on their Facebook page and a different, additional one (with what you see in the picture above) to enter here too. And the picture blurred because he's laughing! Notice the milk level went down, and there's a big bite out of that donut! But back to the message at hand! Entenmann's is proud to join the Great American Milk Drive in the "Entenmann's Donuts & Milk: Perfect Together Sweepstakes!" What does that mean? It means one 8 oz. glass of nutrient-rich milk will be donated by Entenmann's to The Great American Milk Drive, up to 100,000 servings. It also means consumers can enter to win a variety of prizes during the Facebook sweepstakes going on now (through October 31st). The giveaway will provide 25 first prize winners with one year of milk and Entenmann's donuts, and (100) second prize winners with four boxes of Entenmann's donuts. You can ENTER HERE. Enter to Win a ($70 Value) Entenmann's Prize Pack (below)! Then when all is said and done there, be sure to enter the giveaway I have below (or you can enter mine first, and then head on over there to enter their contest, since you're here anyway). Whichever way works for me, but be sure to enter both, because they're both rocking good giveaways! 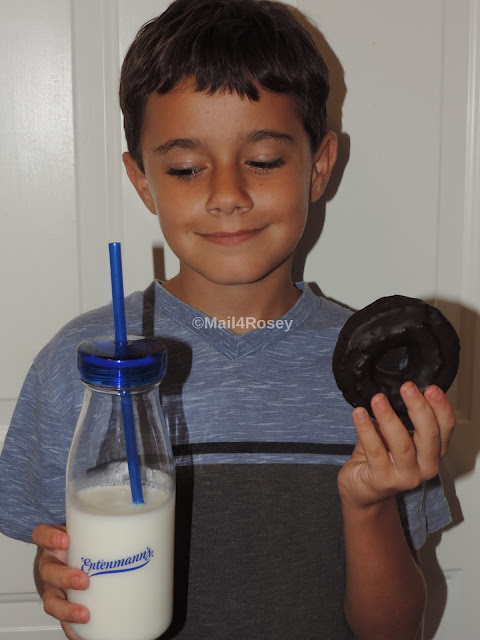 The giveaway here consists of One Entenmann's Milk Bottle Tumbler (so cute, right??? I love this tumbler!!! ), five Entenmann's coupons valued at $7 each, and a $25 AMEX gift card. US entrants only. Good luck to all who enter! Good for Entenmann's. I love reading about companies who are giving back to help their customers. Yes the tumbler is so cute. I would love the free coupons for their snack goodies. The extra money would be handy too. Entenmann's and milk. A perfect match! It's always nice to support a company that is behind a good cause. This milk drive is amazing and it's going to help a lot of people too. You not only get good donuts and a chance to win prizes, you also get to help out. Love Entenmanns products. The chocolate glazed donuts are super. I love that tumbler too! My kids love Entenmanns crumb topped donuts! That looks so yummy. I could use a little pick me up like this. This looks like an amazing giveaway! We love Entenmann's products in our household. Oh yum! Who doesn't love their donuts! I could certainly go for one right now. We love Entenmann's products, especially little bites. My son loves Entenmanns products. I am so sure they are perfect snacks for back to school days. Entenmanns donuts are the best! My favorite is the powdered sugar donuts. They're always moist and have the best flavor! This is the perfect prize pack for my son. He loves milk and Entenmann's chocolate covered donuts. Donuts make a great afternoon snack. I like the chocolate ones. I just love their scrumptious lemon loaf cakes. I love the Entenmann's products! The Chocolate glazed donuts are my favorite! Those chocolate donuts looks so good! What a great way to start the morning or for a treat after school. Entenmann are such a melt in your mouth treat. Oh this is so wonderful that Entenmann's is partnering with them! I love what they are doing to help kids! Milk is so important for our kids. My family enjoys Entenmann's. My favorite is the crumb coffee cake. We love Entenmann's donuts! I haven't had the muffins in a while, but they're good too. Okay, I will be totally honest right now. two- I want to work with them and try out all the tasty treats (not to mention I love the tumbler!) ha hah aha... we love the "baby muffins" but have not ventured out to try everything they offer. If we lived near you, we would be coming to taste test at your place! ha hahaha!!!!!!!!!!!!!!!!!!!! I love Entenmanns. Everything they make is ever so delicious. I'm in. What a great thing for the company to do. Entenmann's Crumb donuts are my favorite. My boys love the mini muffins. I would love to try their crumb donuts! I love Entenmann's donuts, especially the powdered ones. We really can't live without Entenmanns donuts in our house. The kids adore them! We love Entenmann's. I think their cheese Danish will forever be my favorite. My daughter loves the mini bites. We are huge Entenmann's fans in my home! My kiddo's love the mini muffins for breakfast and my husband and I have the cakes every night after dinner! Their cookies and donuts are also staples in our kitchen! We love everything they make! Goodness what a great giveaway. We love those chocolate donuts with milk, so much. I did not know Entenmann's was doing this-very innovative! Thanks for the giveaway! Thanks for the giveaway! My husband loves, loves this brand. My kids are obsessed with the chocolate chip Little bites. I love the raspberry danish twist! It's the best! You just can't have donuts without a glass of ice cold milk! We love Entenmann's chocolate frosted donuts and many other snacks that they offer. We love the Entenmann's raspberry danish twist! I like their chocolate covered donuts with a glass of ice cold milk. Gotta have Entenmann's and a glass of milk everyday. Satisfies my sweet tooth and they have lots of varieties to pick from. That boy looked happy with that donut! haha I don't blame him, milk and donuts are the best meal! These donuts and cakes go just swell with a cold glass of milk. I love these chocolate donuts. My daughter just walked in the door with a box of these for me. Thank you! Our family loves entenmanns products. I love Entenmanns chocolate chip crumb loaf with a cold glass of milk. I've gotten out of the habit of drinking milk, although I like it. Thanks for the giveaway! I love the blueberry muffins. A cold glass of milk and those little bites, make A perfect breakfast for me. Anything from Entemann really makes my day. You gotta love these giveaways, they're awesome and you've always wanted them! I wish we have Entenmanns here in our country. My son will surely enjoy! My goodness this is just amazing. Such a wonderful campaign from Entenmann's in partnership with the Great American Milk Drive to provide milk to children and families in need. When big brands step to give back to the society it really feels so good! Milk is mandatory with delicious donuts, cakes and other Entenmann's treats! I love their banana nut and chocolate chip muffins! We love the Entenmann's Little Bites Brownies. We really like Entenmann's Brownie Bites. I love Entenmann's NY Style Crumb Cakes it goes perfectly with a cold glass of milk. We eat Entenmanns Products all the time! My grandson loves their chocolate chip mini-muffins. I think it is cool that they are giving out 100,000 servings! I love Entenmann's products from their muffins to their cakes and donuts. Entenmann's glazed buttermilk donuts are crazy good. Yum! We grew up on Entenmann's! I love their ultimate crumb cake. I love their chocolate donuts with some chocolate milk in the summer and hot cocoa in the winter. Who doesn't love milk and donuts? I know my kids do! Entenmann's is great. The chocolate cake and donuts are SO good. My family loves Entenmanns especially the crumb donuts and brownie bites. I love their powdered donuts. I love to eat the variety of Entenmanns. The Entenmann's coupons would make my breakfast for a while and the $25 Visa gift card would be great as well! Thanks for the chance to win these. We love Entenmann's products. The kids like the Little Bites. That's a great project, I'm all for kids getting fresh milk. I like milk and blueberry muffins. Entenmann's is a fantastic company. They are always doing awesome things like this. Plus they have really good donuts. Chocolate frosted donuts are my favorite! That is pretty cool of Entenmmans. I'm glad they're helping people out. I love Entenmmans and often have their donuts with my coffee in the morning. Their cakes are great too. I've never tried this brand, but hear about them all the time. I need to try them soon! I like those old style milk glasses. They are pretty fun. Doughnuts and milk do go great together. Omg How good do those chocolate covered donuts look? I love donuts yummy stuff!!! We love Entenmanns products! Thanks for the chance. I buy these donuts and they are awesome. What a great giveaway. I love their chocolate donuts!!!YUM! 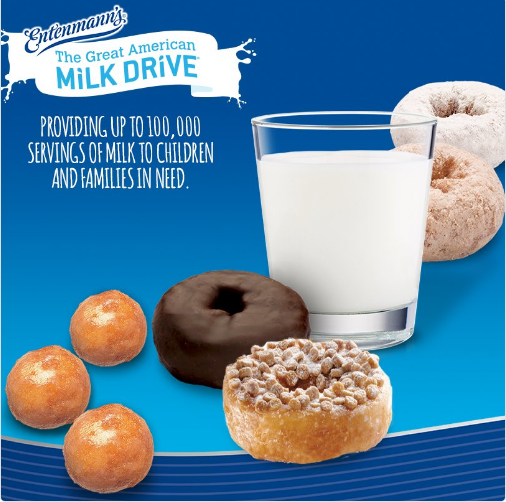 I think the Entenmann's to The Great American Milk Drive is awesome plus I think Doughnuts and milk go well together. The Chocolate glazed donuts are my favorite! Entenmann's is such a great company. I don't blame the little one for not holding still with that yummy donut! love the Entenmann's brand especially their chocolate donuts. Entenmann's products are great! I love their chocolate chip cookies and my daughter loves the mini muffins and the individual packs are great in her lunch box! I love those milk bottles they sent you! the milk tumblr is cute in a retro way. Our family loves Entenmann's and my granddaughter loves her milk. I like to get Entenmann's donuts. I love Entenmann's!! I have their cookbook and would love to win :) Thanks for the chance! we love sweets and milk. Entenmann's has the best desserts. I love their Little Bites. Especially the blueberry muffins and brownie bites. Thanks so much for the chance to win! I love the little bites blueberry muffins. So yummy! Yum! My family likes their donuts. My family loves Entenmanns! Their donuts are the best! I agree, Entenmann's Donuts & milk are the perfect pairing :) Yummy! I love Entenmann's. This would be such a great treat for the kids! I could eat my weight in Entenmann's Cherry Cheese Danish. Yum, the whole family loves the donuts as a snack together. What a cute cup! We love Entenmann's doughnuts. Milk and donuts go together so well. I love the cute milk tumbler and Entenmann's donuts are the best. Entenmanns have been my favorite for years! I love the chocolate frosted with milk the best! I love Entenmann's chocolate frosted donuts! Our family loves anything Entenmann's! I love the Entenmann's powdered donuts. I absolutely love Entenmann's! They are so yummy. My whole family loves Entenmann's products. I love Entenmann's and it is great to hear them giving back to the community. Entenmann's always assures great quality and taste as well as great value. I love the powder donuts. It is something my daughter and i agree on when we go to the store. I liked donuts with crumb topping. Little Bites are our favorite products but you can't go wrong with their little glazed doughnuts!! Nothing beats a glass of milk with cookies, cakes and donuts. I love cakes and milk! Real milk. Any kid would like a glass of milk with Entenmann's goodies. Entenmann's are the best! And the Great American Milk Drive is a very worthy cause. Thanks. I love Entemanns products with a cold glass of milk. We love Entenmann's products. Their perfect with a morning cup of coffee. Our favorites are the chocolate doughnuts and the raspberry cream cheese pastry. It is a tie in my house between the chocolate donuts and the powdered donuts! Aww cute pics- count me in! I love chocolate donuts looks so good! 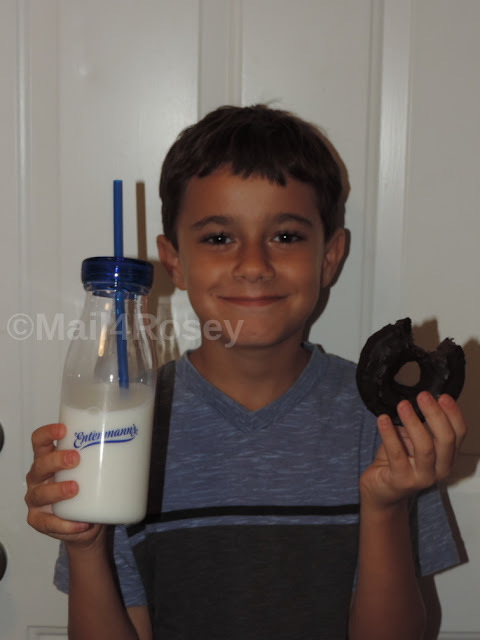 I love the Chocolate Frosted donuts to dip in my milk, supporting this Great American Milk Drive. My husband buy their donuts all the time! Milk and Entenmann's chocolate donuts is the best late night snack! YUMMY! They have such tasty products and I just love that tumbler! By joining forces with the milk industry to provide milk for needy children,, Entenmann has shown again what a great company they are. Our kids favorite treat is an Entenmann's donut during Sunday brunch. We always gave our daughter Entenmann's snacks when she was in school. We trust the brand. WE LOVE THE LITTLE BITES. This would be so awesome to win.. I have always loved anything that Entenmann's makes. Always so yummy..
Coffee with milk and doughnuts is my favorite autumn snack! Nothing goes better than a cold glass of milk and doughnuts! I have never ate a product from Entenmann's that my family and I didn't like! Wonderful to see a company giving back! The kids love their items especially the chocolate donuts. My son does not even like chocolate but loves them. I'm scheduled to bring breakfast food for 35-40 people soon, so this would be perfect! Crossing all things I can!